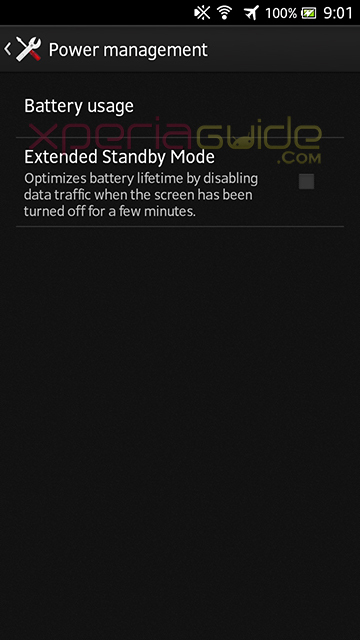 Xperia S,SL,Acro S 6.2.B.1.96 firmware Rolled - Major Update fixed 1080p HD Video Lag, Volume Up button bug. 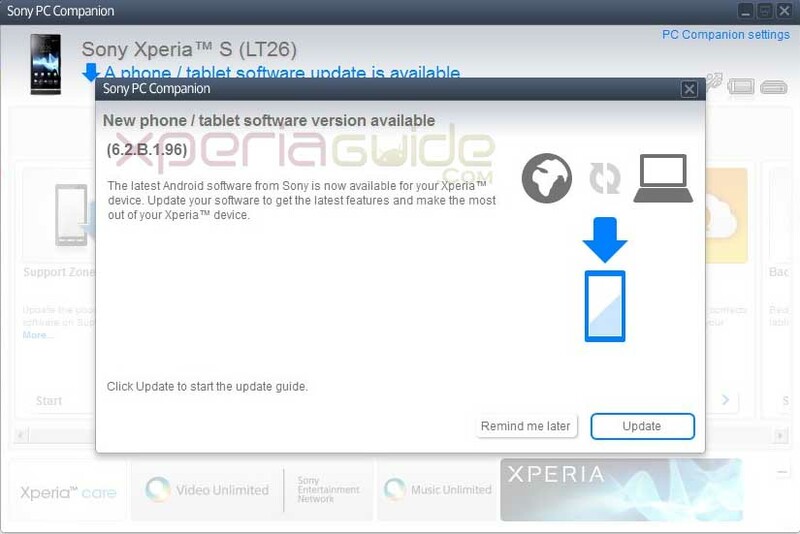 Xperia S LT26i ,SL Lt26ii , Acro S Lt26w 6.2.B.1.96 firmware update rolled out just now officially. It is expected a major update over previous buggy Jelly Bean 6.2.B.0.211 firmware update. 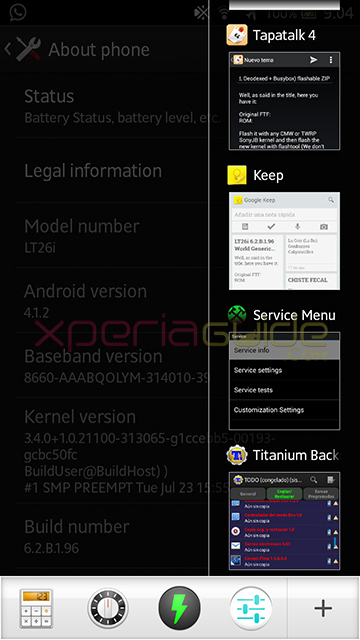 Phone Model – Xperia S, SL, Acro S.
A little bit modification is noticed in new kernel of 6.2.B.1.96 firmware. Connect your phone to PC Companion and check whether you have got 6.2.B.1.96 firmware update notification or not, if yes then proceed as per on-screen instructions. If 6.2.B.1.96 firmware update notification is not available then you can try updating by SUS also. For all those users who don’t want to wait for official update notifciation they can manually update by flashing ftf. 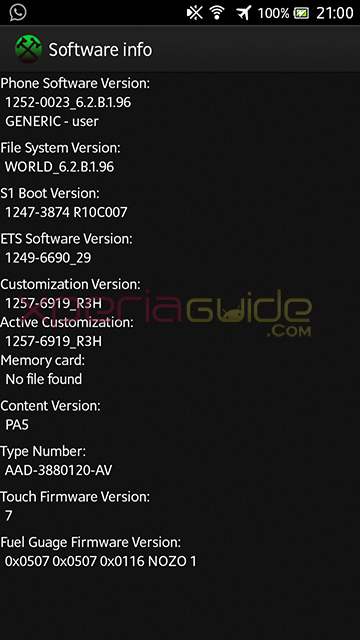 Download the 6.2.B.1.96 firmware ftf file from given below link. Both ftf are for working on locked / unlocked bootloaders. All 3 files are from WORLD region, so download any. Download below 3 files and join them using software “HjSplit”. 6.2.B.1.96 firmware is a major bug fixing update over previous 6.2.B.0.211 firmware, we are checking the new features and fixed bugs yet. If you have updated to 6.2.B.1.96 firmware, kindly let us know the changelog and new features in comments. Let us are you satisfied with this new firmware update ? While reporting please mention your region also. 184 Comments so far. Feel free to join this conversation. no stamina mode for XS yet 🙁 Sad. is booting time increased on this new 6.2.B.1.96 firmware ? What about wi-fi fix for Syrian users ? YES REALLY ?? IS IT WORKING IN SYRIA ?? AND WHAT ABOUT THE WI-FI PROBLEM ???? how much total ram available now ? got update in india for my XS , no update for xsl yet ? Touch response is great now, no lags in home launcher. I installed the update, but dont recognize my sd card! XS with UBL! Can someone help me? No update yet pro XSL in BRAZIL. Pictures MMS bug fixed too ! THANKS !!! Is The ftf File Above For Locked BootLoader ? Both ftf are for working on locked / unlocked bootloaders. No ftf for XSL? SUS not updating in Colombia, by the way. Is there any known fix for windows 8? It is just impossible to start in the mode while holding volume UP and connecting USB cable at the same time..
No issues it works on my windows 8 pc. Power of the phone, restart it try another usb port of pc. Weird, It doesn’t work for me. I always get not recognized. hey there xperiaguide, any fix on battery consumption bug from this update? 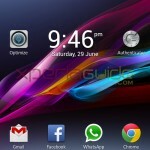 Will this ftf work on xperia Acro S or is it only for xperia S/SL? they dont fix the battery 2x drain?why? Please post more info regarding your battery drain…screenshots please…. yup! i agree with that. sony please fix that thanks! What about battery Draining in comparison to ICS and previous Jelly bean Updates? 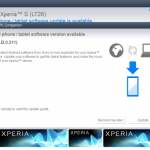 can someone re-upload the .96 world ftf file for xperia s..the download speed for depositfiles is so slow..please someone re-upload it..like via tusfiles or mediafire.. Please use 2nd ftf downloading link , speed is 500kb/ps on it. We did not get any updates for XS in Syria , I don’t know why , but it realy makes me very confused ..
which .ftf file is better to download for india? In India i have WORLD file so you can download any of above given files…both are WORLD FTF files, prefer 2nf ftd link – more downloading speed. Can I flash this on my XSL? It says LT26i. Please reply. You can edit build.prop and make about phone again lt26ii after rooting. FOR ROOT check update section in post. Will i loose root and custom recovery if i will flash this ftf? Yes you will loose root and recovery. what about my 79 apps installed?any idea how i can get them back AFTER flashing,without downloading them from play store manually? well make a back up of all apps first ( via AVG ) and then copy the back up files which contain all apks to your PC and back up the data via PC Companion. After flashing, install avg > copy the folder in phone > avg recognizes it > back up all apks > back up data from PC Companion. If you are rooted now, titanium back up, you can restore apks from it. 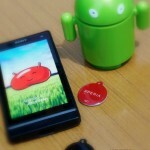 not getting update for xperia SL till now in assam…..plezzz help..
Hello, where I can find the firmware. Ftf lt26ii xsl? Here in Brazil is not yet available in sus. can i find a zip file on the update which can flash via cwm ??? Yes will update it soon, m online from phone right now…as soon as i get back to my lappy will update it. P.S. do read all comments on that thread before updating. I checked it,,that flashable zip has no kernal on 1.96..we need to flash the kernal(by DooMLoRD) via flashtool..
but the flashable zip worked for me..
my phone is xperia acro s JB .200. will i also get update. because mine is .200. i’m from bangladesh. and is it possible to share generic acro s FTF of .96? if i don’t get update via pc companion or SUS , i’ll update it manually. if possible please Anurag answer me. yes you will get update as soon as it reaches your region, this update first come to Xperia Acro S.
We are trying to get the correct file for Acro S ftf but can’t find it yet…as soon as we get it will update the links. P.S. XSL users will also update links for you too. 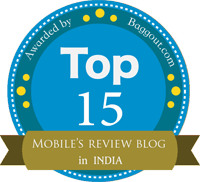 Thanks Anurag for your quick response. i also do not understand another things. in new rooting method, where do i get .211 karnel and .96 karnel for acro s? in that post there is karnels for XS. so if i want to root my phone after update to .96, how do i do that? and how to flash karnel only via flashtool. is there any tutorial with screenshot about it? for kernels you need to get them from previous rootable xperia acro s jb .211 kernel and extract kernel from this new firmware .96.
thanks. yea i know how to flash whole firmware via flashtool. but i want to know how to flash only the karnel via flashtool as doomlord says to flash it. another thing, though my phone is rooted but it is .200 version, so how i collect .211 karnel? 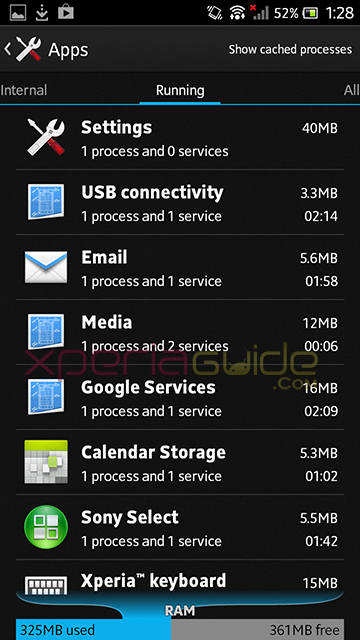 and please let me know by root explorer where i find my phones karnel which i’ll be save on my pc? You need to decrypt your present firmware via flashtool and then make a ftf and then extract it, take out the kernel.sin file from it. Here you got it. 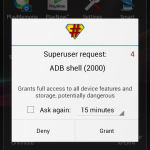 Check on DooMLoRD’s official page, there is a link below, ask him to give you Acro S kernel if he have. thanks Anurag. you are really a helpful person. 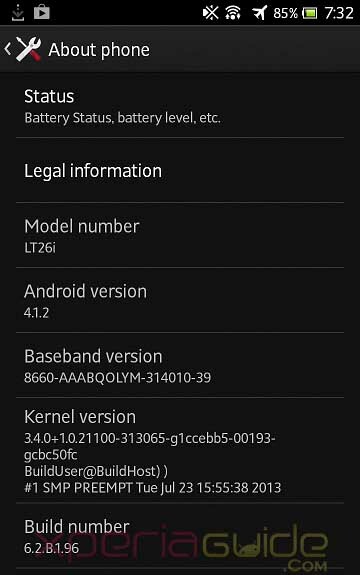 I am afraid if this update is regional, just like .55 firmware in Android 4.0.4, as I still cannot get the update. 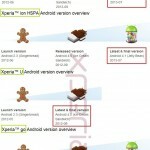 When Xperia S was upgraded to Android 4.1.2, I can get the update after roll out in three hours. Anurag, i got acro s ftf and .211 , .96 karnel also. and i want to share the link. could you please, add these links on your post? if that so , acro s owners also update there phones also. Hello yes we are adding the links. yea i see that the link is 769 MB.but i talked with some people who download and flash it. they says everything seems ok. though i did’t flash it, because i ‘m waiting for the official update, as you say i will also get it. :D, thats why i’m waiting for it. yes we have added the links ( all 3) but we wonder why this ftf is of 700MB size+, can’t say how it worked :/ Well i’ll add a warning ” flash at your own risk”. Yes everyone will get this update…it’s a global update. Wait till we find suitable Acro S ftf. UPDATE :- We have got the right Acro S ftf 485 MB size, we are updating the link, you can download it and install it. After downloading send us some screenshots via our “contact” us page. ok i’ll download and flash it. do i need to change anything on my device? and should i need to make a factory reset after update for a fresh update? i ask it because, this is the first time i’m going to update my phone via flashtool. # Dial *#*#7378423#*#* > Service Info > Software Info > take screenshot, save it. # Make a back up of all data via PC Companion first. # Back up all yours APKS via any antivirus ( like AVG ) ans store that file of backup in your PC separately so you can get all those apks back after flashing. # Do a Factory reset. # Flash ftf using Flash Tool. # Restart phone you see .96 firmware > Do a Factory Reset. # Now after flashing “Repair your firmware via PC Companion again, so you get latest firmware from SONY now directly / OR re-install fresh firmware via SUS”. 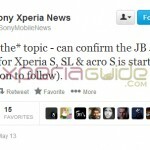 Please anurag when you will post the link the file containing the ftf Xperia sl lt26ii? Please! 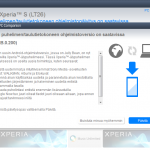 Jb 6.2.b.1.96 for xperia sl (lt26ii) world!! anurag, when i’m going to flash my phone , it shows this error. i made a factory data reset before start flash with erase internal SD. everything has gone but SU is still there (that means root access didn’t go). is it normal? i had done it two times. both with internal stores erase. everything is gone but SU & CWM is still there. hey don’t worry it’s normal…no issues…i remember factory reset doesn’t erase root and CWM. Is flashing working or not for you now ? mine is windows 7 64 bit pc. when i install flashtool, it install both 64 and 32 version . i tried both, didn’t work. can’t say why are you stuck at this error :/ seriously no idea, i have. i think it’s the ftf file which make problems. because when flashtool is going to prepare the ftf file, it shows error. is there anyone who update there phone with this ftf? any feedback? i just started download the ftf again. let see what happen. oh yea , i just download the file again and that is worked. ftf is ok.
where is the link for lt26ii? for this update i can only see lt26i only… can you privide it thanks.. or its same? – NFC transfer works to my dads S3 works fine. Do let us know about battery stats after 24 hrs. Morning from NZ. I have lost around 15% while on standby overnight with extended battery mode enabled. Had wifi and 3G enabled with full brightness, all my apps logged in as well like FB, tango, whatsu, viber, line and wechat. Mobile was on standby for about 7hrs. Also noticed the volume can go much louder than it could on ICS. Running on 56% now. See how long this lasts with 3G enabled for the whole day. Anurag, yet you do not have any news about. Ftf XSL? Please if possible, answer me! though they didn’t say anything regarding Wi-Fi bug. 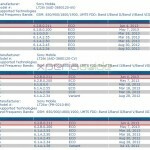 Official Changelog of Xperia S,SL,Acro S 6.2.B.1.96 firmware Update from Sony, Sony quoted statement on their blog today. 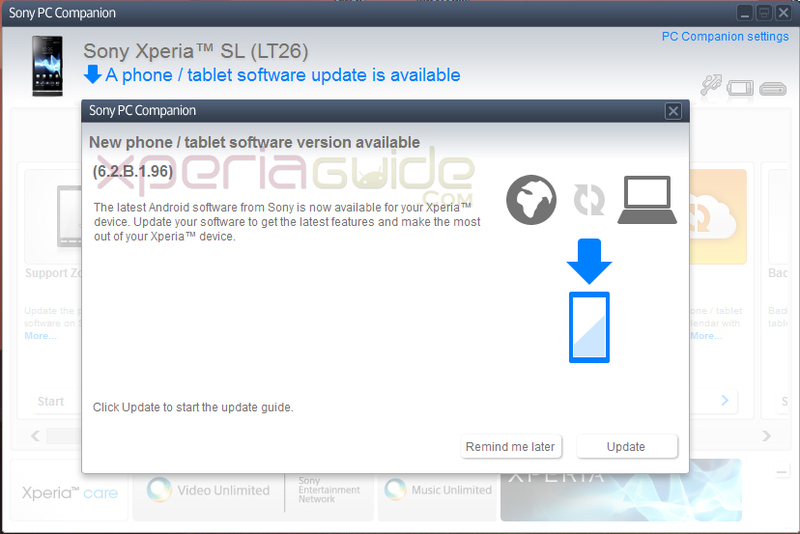 until now i did not get any updates from .211 to .96 on Xperia S , neither from PC companion , or SUS , i’m in Syria , plz help ..
i got the update on Xperia Acro S in Syria and it is working fine except the wifi which is still not working only in airplane mode. it seems link is not working any more, taken out may be…any mirrors ? did you download it ? Blank was made by us intentionally to make link not available for crawling via bots. it is working now, let us update the post. Sorry I did not know that cause link is a little slow but downloads. I’ll level up the upgrade file on a server XSL world and I’ll pass the link here. The update has already been released worldwide for all models mentioned in the post anurag, try to check in with their SUS devices connected via usb. Well if you have WORLD ftf link of XSL, please mention in comments or send to us via tip us page, we will update in post. choose Google drive for uploading..
Two ways of posting screenshot, either you upload them somewhere and post image links here. Got it in Mauritius for XSL. Updating now…..
My phone is being charged. As soon as I update it, I’ll upload the ftf file. Do send us the “About” phone screenshot and software info screenshot via “Tip us” page. IS THIS FTF FOR ACRO S GOOD? ANY BUGS? I ALWAYS HAVE 90 MB FREE – NOW THEY ARE 364 AS A STABLE FREE RAM WHILE IN IDLE MODE , IT IS NOW RESPONDING FASTER THAN B4 – JUST IT TAKES LONG TIME AT THE 1ST START AFTER UPDATE , WALKMAN IS BETTER – AND THE SPEAKER IS LOUDER NOW . SEND US “about phone screenshot, software info screenshot” via tip us page. Can you upload the XSL ftf ? yes i can send screenshot , but how i can upload it ?? send me your mail on my mail. use this link to send screenshot – http://gizmobolt.com/tipus/ upload there…. Upload it on google drive. Update available in Colombia! SL here. Downloading as soon as my phone is charged enough. I have no idea how to. I mean, I know there’s an option to make it using Flashtool, but that’s all I know. As soon as I learn how to do so, I’ll do it. By the way, it’s in Colombia, but it’s the Generic version. Got to my computer > unhide hidden files > now go to program data > look for sony ericson folder or sony mobile folder > go to folder ‘db’ > blob fs > now copy the two largest files in this folder mainly around 300 and 14 mb > now copy them in a separate folder. I may have skipped some folder name , look for above folders..
It’ll be ready in around 5 hours (when I’m back home). My internet is being gay, but here’s the folder where I’m uploading the .ftf in part files. It’s my first .ftf, so I’M NOT RESPONSIBLE FOR ANY BRICKED PHONES. However, I’m a Computer Engineer, and I’m pretty sure I followed the instructions correctly. Just had to be clear with that disclaimer. Can i flash directly this update on top of ICS 4.0.4 ? or i have to flash first to 6.2.B.0.200 and after that flash this file? Thank you! kind regards. You are still on ICS ? OMG. yes you can flash it on any firmware you want. Thanks Anurag xD and Yes, ICS until today, that i have time to risk my device on the experiment of flashing from my GNU-Linux box. I was waiting for Sony until they fix those horrible issues from .200 and .211 of the JB firmware. I flashed a FTF file without USB debugging mode on my XSL. The flashing went well but I cannot see anything on the screen. The phone starts normally with the screen lights on but nothing can be seen. 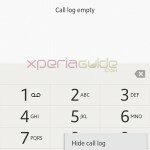 Xperia Sl World file is broken? links not working , please post some working link for download ! how can i install CWM recovery on 6.2.B.1.96?? If you haven’t got the update notification till now, then you need to flash the ftf file. download the required ftf file of your phone from above links. Any news on your Sony’s friends about fixing Wi fi problem in Andorra (Europa)??? Hello Anurag i’m from Bangladesh…I need ur help. P.S : Now what to do? I rooted my device, I have installed CWM recovery but I don’t know why my phone doesn’t flashing? It’ll be very helpful if u tell me what I need to do? hello, I commented that I have a serious problem with my phone Sony Acro S (LT26w), what happens is that when you turn on wifi, the phone goes to safe mode and can not be reused and must be charged the official rom JB with flashtool. who do you think is the problem!! 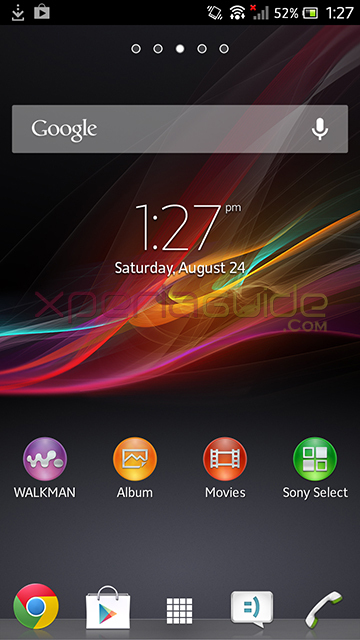 I have updated my Xperia SL with Jelly Bean latest update 6.2.B.1.96 few days back. After updating issues present in previous update were solved but now I am facing a very new and strange problem:- Whenever I Start my media App ,the wifi drops and after that I have to restart my phone or my wifi router. Else my phone is working very good. I think it is still having some bugs. Please solve this problem…. 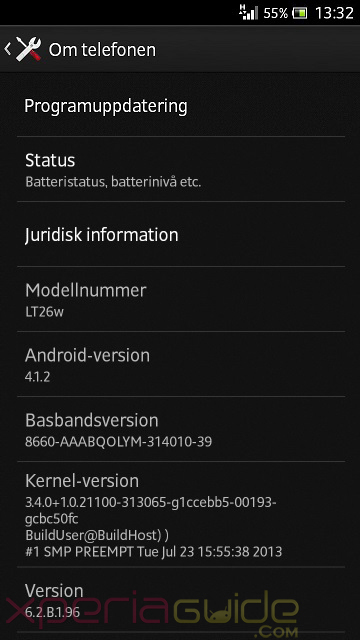 I flashed the 6.2.B.1.96 firmware on my xperia s. Everything is fine but it’s asking the sim network unlock code. I’m using bsnl sim card. can u tell the unlock code.